is a great way to go. In China, train travel is one of the best ways to get around. This page shows a train trip from the Beijing North train station to the Great Wall of China at Badaling. 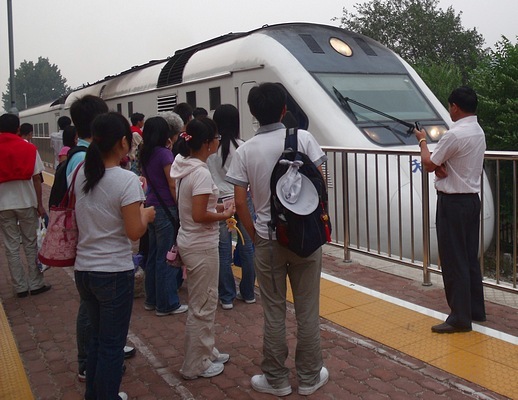 Have you ever wondered what it would be like to ride a modern train in China? Come along and see. The photographic record of this trip, done in early September 2009, starts on this page. As with all photos on this website, these are public domain photographs, so feel free to use them in school projects or other such uses. 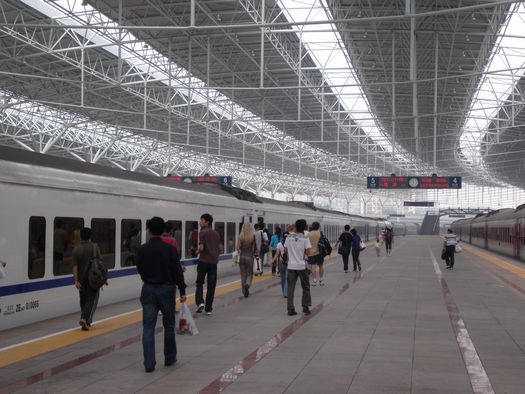 There are several train stations in Beijing. The main one is the oldest one, walking distance from Tiananmen Square. The original Beijing North train station was built in 1905 but it has recently been modernized and is quite classy now! To get there you can take the #2 subway line, which is a circle route that follows the path of the old Beijing city wall. 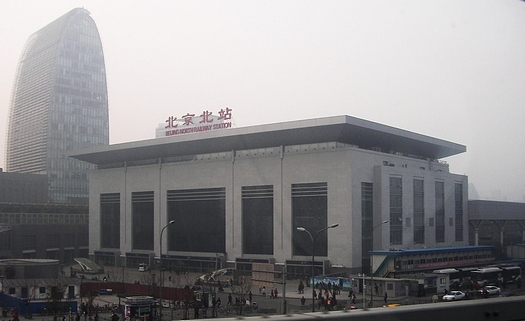 The main train station is on the south-east corner of this circle, and the Beijing North station is on the north-west corner. Take the #2 subway line, which costs only 2 yuan (30 cents U.S.), to the Xizhimen (pronounced something like "see-jer-men") stop. From there the Beijing North train station is about 100m away, but because of construction the walk to it was awkward when I went in September 2009. There's a big intersection just outside the subway station. Turn left without crossing any streets, walk along the sidewalk 50m or so, and look left to see the train station. Go to the room of ticket booths which are on the right as you face the station. Buy the ticket there. You'll need to show it to the guard at the door of the huge waiting room area. 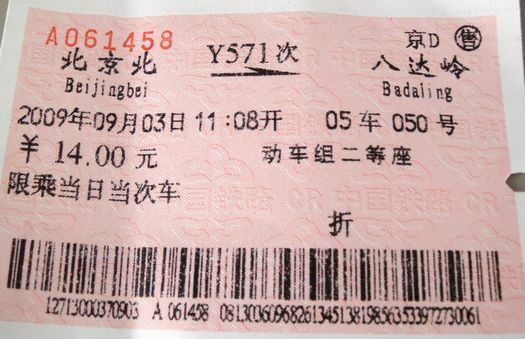 The ticket, as you can see here, cost only 14 yuan ($2 U.S.) which makes this one of the cheapest ways to get there. In general, China train travel is very economical. I got a ticket about 15 minutes before the train left - there were still lots of empty seats available. 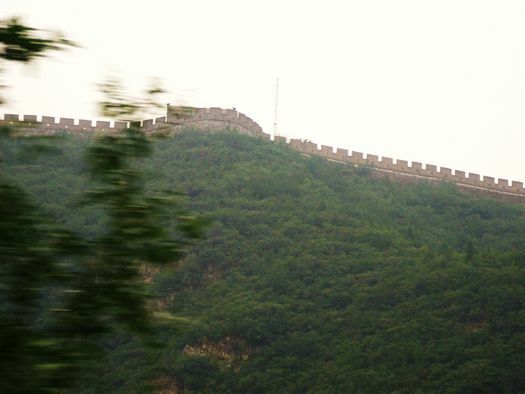 The ticket is to "Badaling" (baa-daa-ling) which is probably the most popular of the Great Wall locations near Beijing. The train waiting room is large and airy, with nice, new, clean washrooms. Everything looks very modern. Here is the platform of the Beijing North train station, looking pretty clean and trendy compared to most train platforms in China. That's the Badaling train to the left. It's one of the modern, high-speed trains that have been coming into China train travel service since 2007 - sleek, speedy, and very comfortable. This is a view of the front of this type of train. (This photo is actually from the return leg of this trip to the Great Wall but it's the same type of train.) Seeing the front of this train, do you doubt that on some routes, trains like these hit a speed of 260 km/h? It's true. That's still pretty slow though, compared to the 431 km/h attained by the maglev train to the Shanghai Pudong airport! Here's the inside of train Y571. Looks nice, eh? Notice the video screens on the roof? Those gave a little pre-trip safety and publicity blurb about the train. China train travel runs like clockwork. Like almost all trains in China, this one started off exactly on time. Fifteen years ago railway travel in China was pretty rough. It's always been inexpensive, but it wasn't for the faint of heart or those who dislike crowds. I've personally seen people climbing through windows to get rush seats. Today, it may still be that way in some of the countryside of China but on the modern routes between large cities the Chinese railway system is something that any country would be proud of. Beware though: During holiday times, despite as many extra trains as the railway system can muster, Chinese trains are packed. If you pay for a reserved seat or bunk, Chinese train travel is much more pleasant but many of my students would stand/squat in the aisles for 24 hours or more getting home at Spring Festival time. All the major routes now have reserved bunks/seating, but getting the tickets can be a nightmare during holiday time. You have to find out exactly how many days in advance the tickets go on sale (it seems to change each holiday), line up well before the ticket office opens, and have good luck. It helps to have a friend who works at the train station. Fortunately, except during holidays in China, train travel is really quite easy, organized, and cheap. 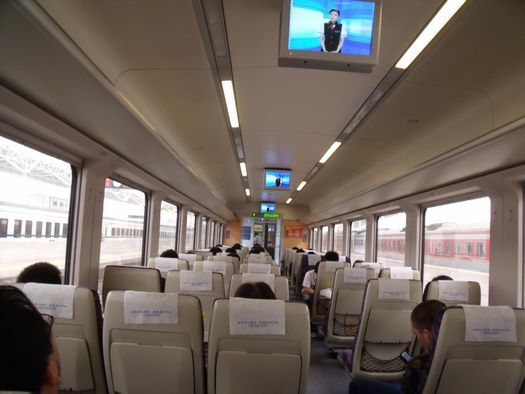 The train I rode from Beijing to the Great Wall (during non-holiday time) had three first-class cars, and what you see in these public domain photographs is one of the three second-class cars. Each ticket specifies a reserved seat but there was so much room you could choose another seat easily. The day I took it, the last car was completely empty and this one was only about half full. Eight minutes out from the station, we're still going through the outskirts of Beijing. Here you see a typical modern apartment block. 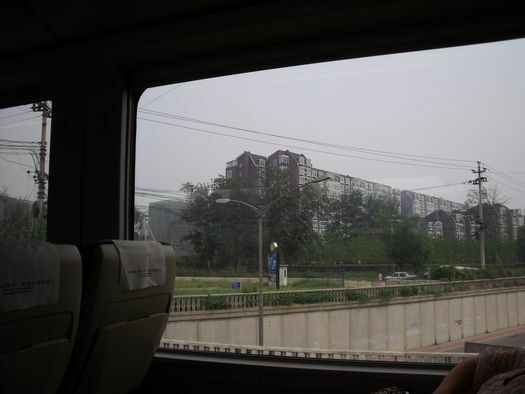 China train travel gives one chances to see both city and countryside, since most cities have expanded to surround the train stations that used to be on the outskirts. 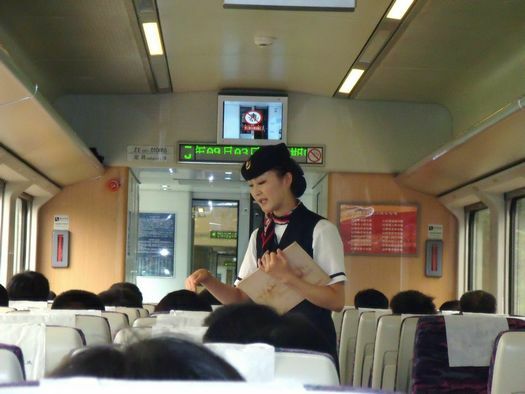 Second-class or not, we got nice-looking train attendants. China train travel can range from grungy to very classy. This train was near the upper end of the scale. There were about four neatly-dressed young women who went through the car checking tickets, handing out water, and doing other things. This lady came around about 12 minutes into the trip selling souvenir books about the railway. Zoom in on the video screen here and you'll see a graphic warning that firecrackers are forbidden on the train. That's reassuring. Now we're 24 minutes into the trip and, having cleared Beijing, we hit one of the sections where the train can get cruising. These trains can do well over 250 km/h easily, but on this route there were too many stops along the way to speed along like that. There were just a couple sections, a few minutes long each, where we hit the top speed you see here. There it is! After about 30 minutes of travel, you start to see sections of the Great Wall. Some parts are broken down but many have been repaired to various extents. The Great Wall is not just one continuous wall; there are sections of it branching off all over the place. I don't believe that they were ever actually all connected. Across the car from me was a young Chinese couple looking about college age. As we passed parts of the Great Wall, she whipped out a cell phone, presumably to share the moment with friends other than her boyfriend. 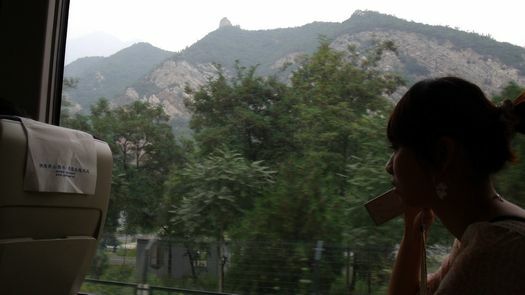 I love the contrasts in this shot: The second-highest peak you see outside the window is a old, broken-down tower of the Wall, and in front you see a modern Chinese woman using her cell phone. After about an hour, we arrive at a station, but wait... this is not Badaling. This China train travels to other places too. It stops and lets a few people off, then actually goes backward for a while to go onto another line. 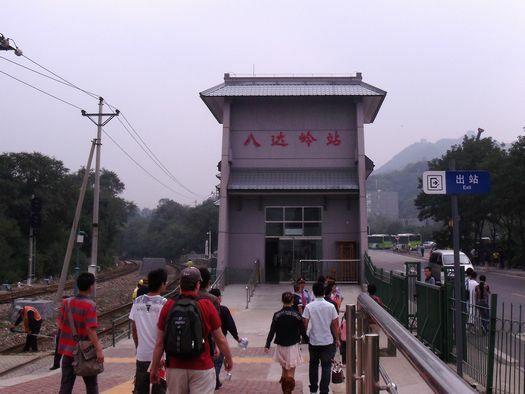 After 67 minutes of travel, we arrive at the Badaling train station and everybody gets off. The station is just a little, bitty place. You can see more of it on another page of this site which gives some shots of the train trip back to Beijing. Click here to see that now. That's the modern young woman and her beau walking hand-in-hand, starting the 800m walk from the train station to the main entrance of the Badaling Great Wall. Lest anyone not realize this was a young couple in love, let's zoom in on the back of her jean jacket. There it is for all to see: "ENERGY OF TURE LOVE". Hmmm. Certainly "TRUE" is one thing they could have meant, but maybe they meant "TOUR" because she and her beau like to tour around like this? Or maybe they're gardeners energized by their love for "TURF"? Ah well. Leave it as just another mystery one runs across during China train travel. If you're just interested in China train travel and the Chinese railway system, click here to see how to take the train back to Beijing.